Hogs are burly and deceptively smart animals. They have thick layers of fat that make it difficult to penetrate into any of their internal organs which will kill them. Hog hunting is popular in many states and legal with a license. It is also possible, and encouraged, to trap and relocate wild hogs if they are an inconvenience, before killing them. Traps - A variety of traps have been used to catch hogs, including swing gates, drop gates and push gates. Camouflaging traps with leaves, branches and other vegetation is important because the traps have to be big to catch these big animals. Throw fresh dirt inside the trap and set up a line of bait right into the trap. Successful baits include acorns, grubs, snakes, fresh plant roots, lizards and fresh dried corn. Fire Arms - Guns are one of the most recommended tactics for killing a hog. If you are 100 yards away, a .27o or .308 calibers will work well. Many hunters also recommend the 30-30 or 30-60 Winchester. High caliber is necessary for making sure you kill the animal and not just wound it. Handguns around .44mag are sufficient for ranges inside 100 yards. Bullets need to be deep-penetrating and hefty. “Ballistic tip” bullets that are normally used for small critters and occasionally for deer will not be very effective with hogs. Bullets for killing hogs need to break bone and rip through fat and cartilage without dissipating into chunk s of shrapnel. 180 grain Nosler Partitions have been used effectively on hogs in the past. For handgun bullets, lead-made (such as the Cor-Bon) have enough strength and sturdiness to work. When shooting a hog, make sure you are close enough for your ability at aim to actually kill the hog. They should be considered with the same skill and range as an elk or moose because their skin is so thick. The fat on hogs is thick and will absorb quite a bit of blood, which makes the blood trail difficult to follow. If you do not kill the hog but injure it, it will limp away into the brush and be difficult to find, even if it ends up dying not too far away. If you use too high a caliber of gun or ballistic tipped bullets, you also run the risk of damaging the skin and meat by embedding it with a millions specs of shrapnel. Bullet shrapnel loaded meat is not safe to eat. Aiming for the lower shoulder will give you the most chance of hitting the vitals, such as the heart and lungs. It is a tricky shot because if you aim to low you will shoot under the hog. Shooting a hog in the brain is effective as well, though the brain is small target and their skulls are incredibly thick. Bow and Arrow - Hunting hogs with bow and arrow is a thrill that challenge-seeking hunters love. It takes incredible practice, skill and patience. The best placement is behind the shoulder aiming for the lungs or heart. If you do not aim well, especially with a bow, the animal will not die and the blood tracking will take a marathon. Bow size should be in the 68 pound range. You need a heavy bow to generate enough power to kill the animal. If you are inexperienced with a bow, you need to practice a lot before your first hunt to make sure you can hold a heavy bow steady for a long period of time and shoot with accuracy. Carbon arrows work well for moving fast and efficiently thought the air, sized around 29 inches. If your arrows are not strong enough they will break on contact and not dig into the hog. Your blade should be at least 100 grain in order to penetrate the hog and kill it. Bow hunting normally involves a lot more blood tracking, as hogs may not die instantly if the arrow does not penetrate far enough. Hogs do not bleed as much as other animals because of their thick skin so tracking can be more difficult. Spear - A cold steel bushman aimed at the ribs or the lower front shoulder vitals. It can be difficult, but keep the spear in the animal if it does not immediately collapse. You need to maintain control until the hog dies. When hogs feel cornered, they typically become very aggressive. When it charges, you are too far involved to not back out of the situation. Keep your stance and remember your aim. Killing hogs is a licensed hunting endeavor but not the only option. 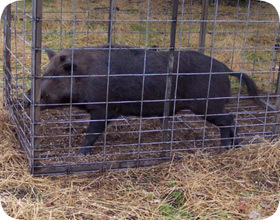 Trapping the boars and contacting the local Department of Wild Life will ensure for an easy hog-relocating process. Read my Feral Hog Removal page for more information.